Flowers early summer - Wild Strawberry Fragaria vesca has White flowers, low spreading the fruits are small sweet and juicy with a delicate strawberry scent a great delicacy, smaller than the garden strawberry, juicer and tastier. 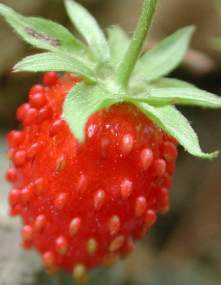 Wild Strawberry fruit is strongly flavoured Also rich in iron and other minerals. Very long fruiting season. Habitat: woodland. Ht low spreading.Grows in full sun to part shade.